← Your Number is 2187, Isn’t it? This week, let’s look at this large sign, which I’ve seen on Coruscant, Corellia and Cademimu. That this is a warning sign is pretty obvious whether you can read the Aurebesh or not. The eye is drawn to the prominent orange text and striped bar that indicate that the sign contains important safety information. Beyond that, there is a lot going on here. 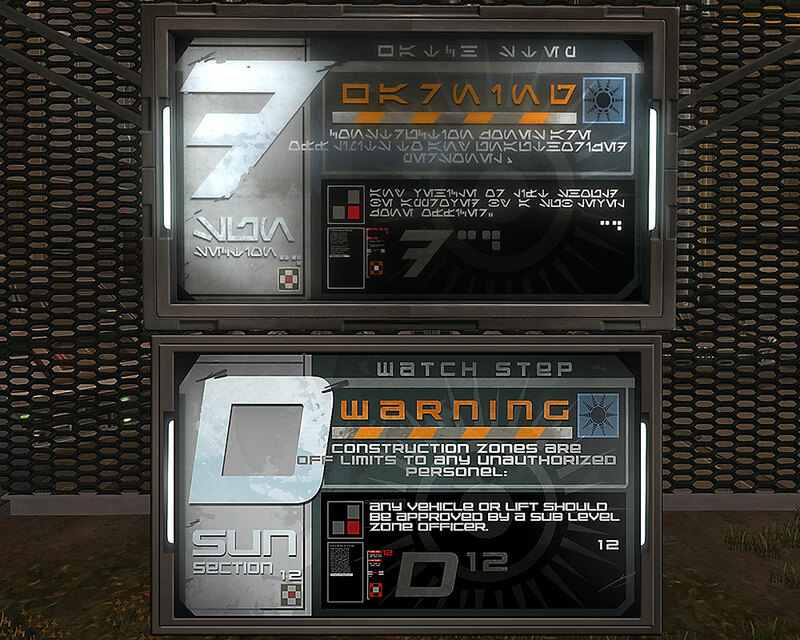 It shares a similar design and graphical elements with many other signs in the game; in addition, it also includes a bit of clunky grammar which is also not unusual. At first glance, I thought the star graphic used in the background was the logo of the Black Sun criminal syndicate, but I quickly realized that it relates to the “Sun Section” referenced in the sign. Twelve must be someone’s lucky number because the digits pop up no less than four times on this one graphic. The large D or “Dorn” letter is a common sight on other Aurebesh signs as well. In my recreation, I italicized the letter to make it more closely match the angle of its Aurebesh counterpart. Finally, the tiny text in the left sidebar of the black, bottom section is probably also aurebesh, but if it contains any juicy tidbits, I can’t say since the text is far too small and low resolution for me to decipher. 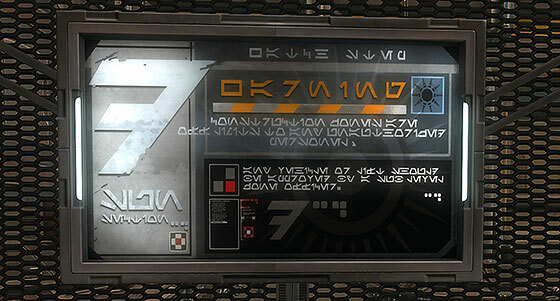 Despite sharing elements with many other Aurebesh graphics in the game, this sign remains distinct from its siblings and works well in a variety of settings across the galaxy.